When organizing a classy themed hen party you are going to need some key classy hen party accessories to help base your theme around. These lovely personalised hen party badges feature a beautiful classic damask pattern and a personalised message. 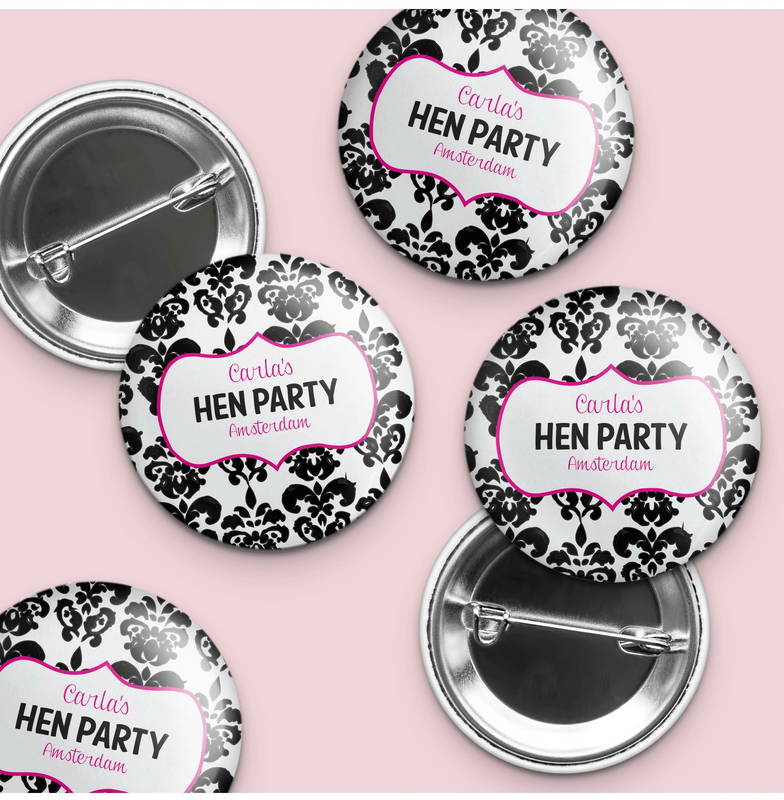 Why not match this lovely hen night badge with a black and white classic hen night theme. Showing our 6 Hen Party Superstore Personalised Hen Party Damask Badge reviews with an average rating of Excellent. Would you like to write a review? These are fab just what I wanted and came on time. The badges arrived on time. They are of good quality and as they look on the website. My only negative feedback is the writing font of my friends name- I think it could be a bit clearer. I was a bit worried on how the badges would look as you can't always tell by the online picture but when I received them I was so happy as they look so elegant. Perfect little momentum for a Hen do! Review - I bought these for everyone going on the hen do. As well as being a good keepsake, they were really useful for holding the sashes up!! As they are silky, then kept sliding off our shoulders so these pin badges came in really useful!! Affordable and dual purpose!! I bought these for everyone going on the hen do. As well as being a good keepsake, they were really useful for holding the sashes up!! As they are silky, then kept sliding off our shoulders so these pin badges came in really useful! !